Southampton: Captain AB de Villiers promised South Africa would "fight our way back" after England thrashed them by nine wickets in the first Twenty20 international at Southampton on Wednesday. 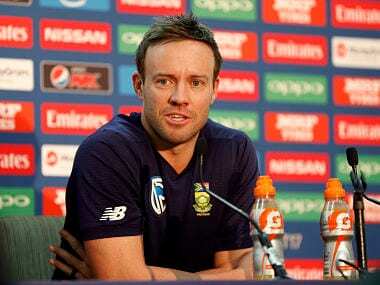 After the chastening defeat, which came after their first-round exit at the Champions Trophy, de Villiers said: "It's not done and dusted. "We go to Taunton and like all South Africans we always fight our way back so I'm expecting a really good performance in the next one." South Africa found runs hard to come by against an England side where spinners Liam Dawson and Twenty20 debutant Mason Crane both bowled tightly on their Hampshire home ground. Young leg-spinner Crane had a particularly encouraging debut with four overs for 24 runs and bowled one bad ball, his final delivery, a full toss hit for four by de Villiers. "We know he has the potential and skill level, he has proved that at county level," said England captain Eoin Morgan of the 20-year-old Crane. "It is about reigniting that form at international level. "His skills are good, we know that, it is delivering them against (players like) de Villiers, who is one of the best of our generation — delivering against him is a task especially when he is coming after you. "The challenge for him now is if people counter him, how he comes back from it? But they are really good signs for a player coming in." The Proteas were reduced to seven for two after seven balls electing to bat first and that became 32 for three in the fifth over. De Villiers (65 not out) and Farhaan Behardien (64 not out) repaired the damage with an unbroken stand of 110 but a total of 142 for three never looked like being enough. England, led by Jonny Bairstow's unbeaten 60, raced to their victory target with 33 balls to spare for the loss of one wicket. "The result doesn't look good for us," conceded Villiers. "We lost our way in the first six (overs), had to rebuild and that cost us a bit. From the 13th over I tried to have a go. We were looking for those 10 runs an over and didn't get a lot of them, unfortunately." England, resting Joe Root and Ben Stokes, hardly had to break sweat. "It is as close to a complete performance as you can ask for," said Morgan. "The bowlers did an unbelievable job even after taking early wickets. "The way we came out and batted dictated things to them. (Jason) Roy 'smokes' for a few overs and it takes the game away." Bairstow again made an impact as a replacement — this time for Yorkshire teammate Root. "He does it every time," Morgan said Bairstow. "It is very healthy for our squad." England, who beat South Africa 2-1 in a one-day international series before this month's Champions Trophy, will now look to clinch the three-match series at Taunton on Friday.